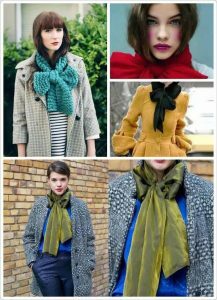 The scarf is a versatile item all year round, in addition to being able to keep warm, it can also add a sense of style. However, it is also necessary to look good in the scarf to enhance the sense of fashion. Let’s take a look at the four ways I want to share today. 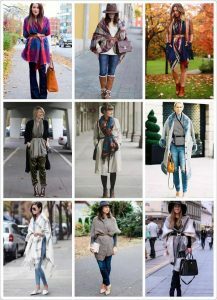 This method is to match the belt, not literally the scarf as a belt, but a combination of a belt and a scarf, such as a wide version of a scarf or shawl with black or brown The thin waistband not only can show the feeling of a blouse or a cloak in the thickness of a scarf, but also can use the various patterns of the scarf to bring out the style of wearing it. 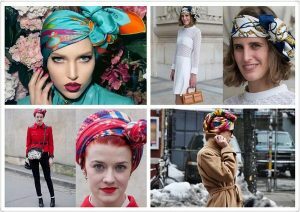 A good-looking silk scarf can not only be wrapped around the neck, but also used as a hair band or a headscarf. For example, a long square towel can wrap your hair to keep the wind from blowing, and it can also have a warmth effect. Putting a square towel or a handkerchief on a bag also creates a trend. The shape of the headscarf is also very diverse, such as: side bows, large bows on the front, hemp laces, and small pony tails. Wearing a big bow with a scarf can also create a retro temperament. Different satin materials can also create different effects, but you may want to use a stiffer scarf like a knitted scarf or a bristles, because if you use Scarves or fine knits may not be noticeable, and the bows that are hit may hang down without a sense of three-dimensionality. There are many ways to stack long scarves. The most common ones should be this way, so I won’t talk about them specifically. Of course, if you have interested friends, you can go to see my previous article, there is a description of the long scarf. PreviousPrevious post:Simple scarf weaving methodNextNext post:How to clean silk scarves?